‘Political party financing and equal participation of women’ is a series of studies conducted in Tunisia, Kenya, and Colombia on political party financing and womens’ roles in politics. In Kenya, the study specifically looks into the role and extent to which access to financial resources determines the success of women running for elective positions. 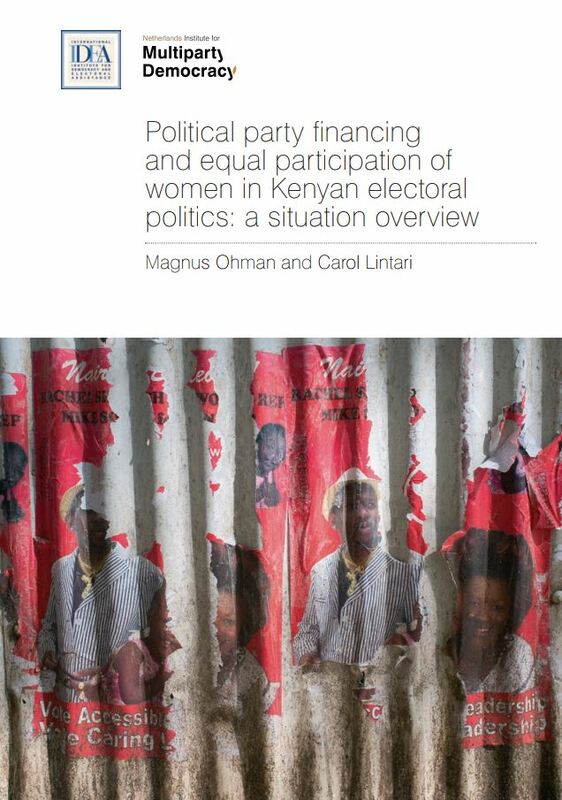 It discusses the main findings on financial barriers for women politicians in Kenya, and makes recommendations for political parties, politicians and potential candidates, Kenya’s electoral management body and other oversight bodies, as well as for democracy assistance providers, to facilitate reforms in this area. The report on Tunisia makes recommendations on how reforms related to the role of money in politics could help women participate and continue to be engaged in politics. These include providing increased public funding to lists headed by women; and providing ongoing public funding to political parties, with specific funds earmarked for activities related to gender equality. Increased transparency in political parties and election campaigns could also, with time, help to balance the participation of women and men in the political sphere. Finally, in Colombia, the study focuses on the experience of Colombia, a country that, like many other Latin American countries, continues to struggle with the legacies of pervasive social, economic and political inequality that disproportionately affect women. It explores the role of political finance in hindering women’s access to political power and its relative weight with respect to other obstacles to women’s political participation. It also suggests a number of institutional changes that might ameliorate some of the problems identified, while being fully cognizant of the limits to institutional change recasting deep-rooted gender imbalances. Below, you can also download the NIMD-International IDEA Factsheets on women’s access to political finance in Tunisia and Kenya. NIMD has become increasingly involved in fragile and conflict-affected settings (FCAS), or settings in which the political environment is extremely polarized and divided due to a lack of trust among political actors. NIMD’s strategies on interparty dialogue and capacity building are highly valued in these settings, where the strengthening of political legitimacy is viewed as a pre-condition for sustainable peace, stability, and development. In ‘Our Stories’, you can read about NIMD’s experiences working in various fragile and conflict-affected settings, including Burundi, Honduras, Colombia, and Mali. You can download the publication containing all of these stories, or you can download each story individually. One specific context in which NIMD has increasingly been involved is that of fragile and conflict-affected settings: settings in which the political environment is extremely polarized and divided due to a lack of trust among political actors. This brochure outlines the challenges and key lessons NIMD has learned from its experience in fragile and conflict-affected settings, as well as the main focus areas of NIMD’s approach to party assistance in these settings over the coming years. Gender equality and diversity are important focal points in NIMD’s work. Through our programmes we aim to contribute to the active participation of all groups in society and the equal distribution of power and influence between women and men. The brochure describes our work on gender equality in political parties and party systems. With this publication, International IDEA, the NIMD and the Oslo Center for Peace and Human Rights provide dialogue facilitators and political parties with a practical tool for political party dialogue. Building on case studies from different countries around the globe, the Guide will enable actors to: assess the general conditions for political party dialogues; build trust; convene and organize dialogues; set their goals and prepare their agenda; facilitate their smooth evolution through various stages; ensure meaningful results and; last but not least, foster the implementation of the understandings and agreements reached. Read an article on the publication and the Political Party Dialogue training module on the website of Agora. This publication provides a set of guiding principles for constitutional reform based on practical experiences of constitutional reform processes in a number of countries (Bolivia, Ghana, Indonesia, Iraq, Kenya, Malawi, Zimbabwe and South Africa). While the primary focus of the publication is on the role of political parties in constitution-building processes, the publication is also of relevance to other actors involved in similar processes as it provides the reader with an overview of common phases, characteristics, challenges and guiding principles that may be customized to country specific contexts. This fact-finding and policy review paper – commissioned by the Netherlands Institute for Multiparty Democracy (NIMD) – is a comparitive analysis about the impacts of organized crime, and specifically drugs related crime, on the Latin American political systems. The focus of the study is on Mexico, Guatemala, Colombia and Bolivia. The effects on the political system, key institutions and political parties also differ by country. NIMD’s Africa Regional Programme (ARP) aims to stimulate interaction between political parties on the continent on themes which influence national democratic reform agendas. Through a process of peer exchange, African politicians share experiences and identify appropriate solutions to complex political challenges. This publication documents six visits involving politicians from NIMD programme countries. In-depth interviews with 13 political parties that did not participate in the work of State Constitutional Commission. It was conducted by CRRC for NIMD in early 2010. The report includes observations from regional debates on Constitutional Reform supported by NIMD in summer of 2010.